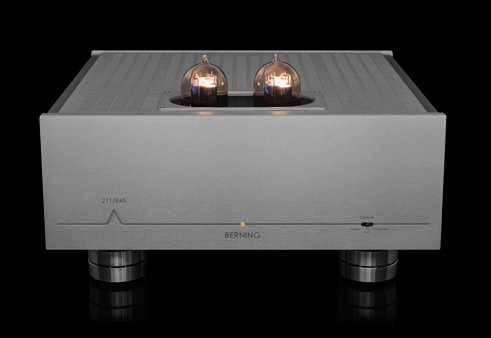 "...I won’t mince words: The Berning 211/845 is the most beautiful sounding amplifier I’ve ever heard. One could easily invoke the stereotype of a triode amplifier that has no feedback and lacks an output transformer, and immediately jump to the conclusion that the word “beautiful” means that the amplifier imposes itself on the music in a flatteringly euphonic way, like a soft-focus filter on a lens. But that’s not the case. The Berning sounds beautiful because music sounds beautiful; this amplifier simply introduces less artifice and coloration that would diminish that beauty. The 211/845 is unique in the way it strips away a kind of electronic tincture, leaving in its place a totally natural and believable musical presentation. With most superb systems, certain recordings can, at certain times, create a “fool-you” realism that sounds so lifelike you experience a sudden frisson. The 211/845 delivers such delights regularly, and with apparent ease. Moreover, the experience doesn’t last for a brief moment before the illusion collapses, but is sustained for entire pieces of music. It’s quite a magic trick, conjuring a startling palpability by stripping away the last vestige of an electronic signature. It’s as though instruments and voices have been laid bare, with a natural and organic quality. Reproduction of the human voice is a particularly stark example of this amplifier’s utter transparency. I could cite any number of instances, but two come immediately to mind as particularly vivid: Ella Fitzgerald on the 45rpm Analogue Productions LP of Ella and Louis and Jennifer Warnes on The Hunter[Impex LP]. On the track “Moonlight in Vermont” Ella’s entrance is genuinely startling, so convincing is the illusion of a living, breathing human being standing between the loudspeakers. The more modern recording of Warnes was rendered by the Berning with such immediacy that I felt that I heard her voice’s beautiful and unique timbre fully for the first time. On both examples, the Berning conveyed nuances of timbre, dynamics, inflection, phrasing, and expression in previously unparalleled abundance. Thanks to these qualities, the Berning is a crystal-clear window back through time to the original musical event. The 211/845 experience is like that of the best direct-to-disc LPs or first-generation analog tapes; you can immediately hear that a layer has been removed between you and the music. In its ability to reproduce instruments and voices with this level of believability, the Berning has no equal in my experience..."
DAVID BERNING COMPANY ANNOUNCES NEW PRODUCT LAUNCH AT THE 2014 MUNICH HIGH END SHOW RM F131 MAY 15 – 18. The amplifier will automatically bias to 211 or 845 output tubes. No user adjustment is ever required. Output transformer less. 60 watts per channel. Class A Triode. Differentially balanced. Zero global feedback. Proprietary advanced switch mode power supplies with full Power Factor Correction for global plug and play operation. Constant output impedance over the entire audio spectrum utilizing the patented Berning ZOTL circuit. Drives difficult dynamic loads within its power rating while the inherently low noise floor accommodates high efficiency loudspeakers. Stillpoints Ultra 5ʼs, Ultra Bases and circuit board isolators are integrated for vibration control. Stillpoints cryogenic treatment is selectively utilized throughout the amplifier. Additionally, Stillpoints Aperture Room Treatments and Fono Acustica cables will be fully implemented in our Munich demonstrations. For further information, please visit (davidberning.com). For global product acquisition, please contact Rick Brown at Hi Fi One (rbhifi1.com).